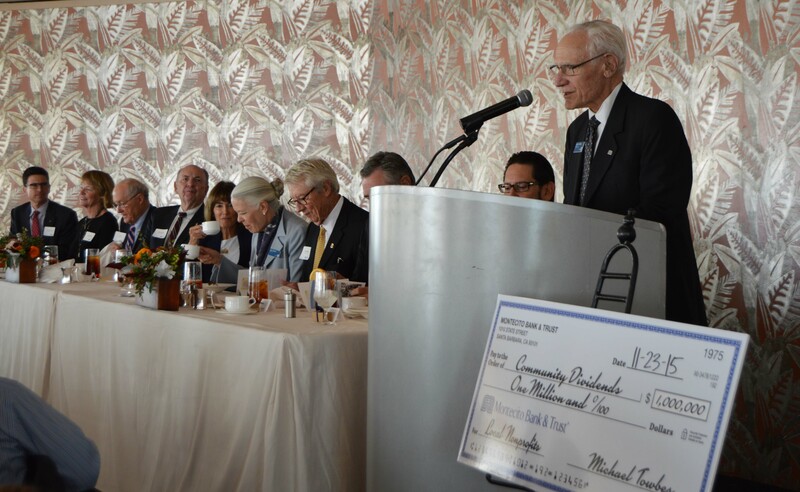 Michael Towbes announces Montecito Bank & Trust’s award of $1 million to 184 nonprofit organizations on Nov. 23. A common thread at two recent philanthropic events in the Tri-Counties was the idea that individuals should get involved personally rather than simply donating money. On Nov. 19, the Association of Fundraising Professionals celebrated community members in Santa Barbara and Ventura counties who have been active in volunteering or organizing support for community institutions. On Nov. 23, Montecito Bank & Trust — which doles out $1 million in charitable donations every year as part of its Community Dividends program — gave money to 184 nonprofit organizations. “While Community Dividends is the largest and most prominent part of our community support, our corporate philosophy extends well beyond this, both in terms of donations and the volunteerism of our staff,” said Michael Towbes, chairman and director of the bank. In 2015, Montecito employees donated more than 1,800 hours by serving on boards, offering financial expertise, fundraising and volunteering. Volunteerism is a priority as early on as the hiring process and there is an internal submission process for employees who want to advocate for nonprofit groups to receive a share of the Community Dividends funding, said Jamie Perez, associate vice president of the bank and community outreach and events manager. Held at the Four Seasons Biltmore hotel in Santa Barbara, the 13th annual Montecito Bank & Trust luncheon honored nonprofits that support low- to moderate-income groups in Santa Barbara and Ventura counties with programs focusing on health and medical services, youth and education, the arts or social services that provide for basic needs. Many of the organizations that received checks had participated in Community Dividends funding in previous years. Recently, though, Towbes has taken steps to rotate awardees and make room for new or previously unrecognized groups, Perez said. Nominations for the AFP awards also came from within the community and some, like that of Gerd Jordano, who was named Volunteer of the Year for Santa Barbara County, were shared aloud. Joanie Young, who was named Volunteer of the Year for Ventura County, told a story about childhood fundraising as she accepted the award. The atmosphere of giving within the community is what enables them to create and organize so many projects, Young said, and other speakers highlighted the importance of maintaining relationships within a community when it comes to making a difference through philanthropy. Montecito Bank & Trust President and CEO Janet Garufis — who was honored as a Volunteer of the Year at the 2014 AFP luncheon — will become vice president of the Community Depository Institutions Advisory Council next year, Towbes announced before the checks were distributed to attendees. The CDIAC represents local lending institutions to the Federal Reserve, and Garufis will eventually chair the committee as a representative of the 12th Federal Reserve district in 2017. As the bank expands, there has been talk of increasing the Community Dividends budget, Perez said. Throughout the year, the bank also offers sponsorships, grants and donations outside the program.